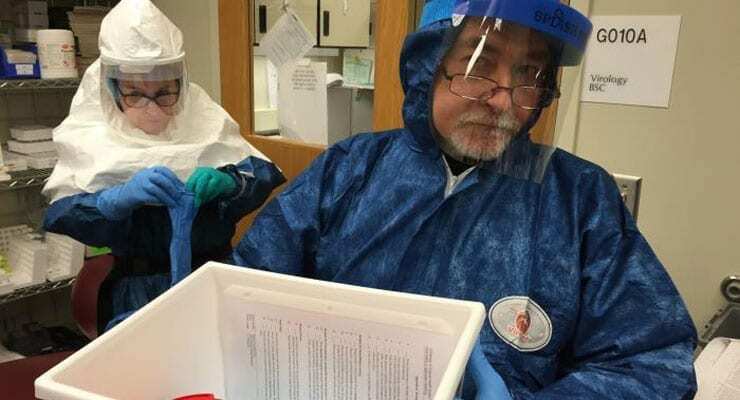 The Centers for Disease Control and Prevention (CDC) today released a detailed account of the agency’s work on the largest, longest outbreak response in the agency’s history: The Ebola epidemic of 2014-2016. The series of articles, in a special supplement to CDC’s Morbidity and Mortality Weekly Report (MMWR), comes on the second anniversary of the official activation of the agency’s emergency response to Ebola. The 2014-2016 Ebola epidemic was the first and largest epidemic of its kind, with widespread urban transmission and a massive death count of more than 11,300 people in Guinea, Liberia, and Sierra Leone. CDC’s response was directed simultaneously at controlling the epidemic in West Africa and strengthening preparedness for Ebola in the United States. CDC activated its Emergency Operations Center (EOC) for the Ebola response on July 9, 2014. On August 5, 2014, CDC elevated the EOC to a Level 1 activation, its highest level. By the time the EOC was officially deactivated on March 31, 2016, more than 3,700 CDC staff, including all 158 Epidemic Intelligence Service Officers, had participated in international or domestic response efforts. There were 2,292 total deployments to Guinea, Liberia, and Sierra Leone and 3,544 total deployments overall (domestic and international) to support the response. Approximately 1,558 CDC responders have deployed to Guinea, Liberia, and Sierra Leone since the start of the response in July 2014 to the close of the response at the end of March 2016 – including 454 responders with repeat deployments. Even after the deactivation of the CDC 2014-2016 Ebola response, CDC continues its work to better understand and combat the Ebola virus and to assist Guinea, Liberia and Sierra Leone in the aftermath of the 2014-2016 Ebola epidemic; currently, CDC staff remain in CDC country offices in Guinea, Liberia, and Sierra Leone to help support the Global Health Security Agenda. Forming CDC Rapid Ebola Preparedness (REP) response teams that could provide assistance within 24 hours to a health care facility managing a patient with Ebola. The full MMWR Supplement on the response to the 2014-2016 Ebola virus disease epidemic and related information on the individual chapters available at http://go.usa.gov/x3ASd. Next article Superbugs & Superdrugs Comes to the U.S.